From the north I see a sun slowly rising into the sky. But not just your usual a-typical type of sun, my friend. A red sun. A huge red sun gleaming down over the red hills, situated near a lot of people who like to chew gum and take names. My mate Robbie is just such a person. Here, check out his red themed comic book for what he's got in store. 1) What are your own origins, Robbie? My origins are pretty boring actually, as I live a life of a typically banal suburban existence. I was born in Toronto, Canada, to Bob and Max, but my journey didn't really begin until we moved to the suburbs. I met other adventurous lads here, spending endless summer nights ripping around on our bikes, building tree-forts, and nicking older boys' skin mags. Then, one night when I was 13, I watched A Nightmare on Elm Street 2 at a friends' sleepover birthday party, and everything changed. That's when I fell in love with horror. 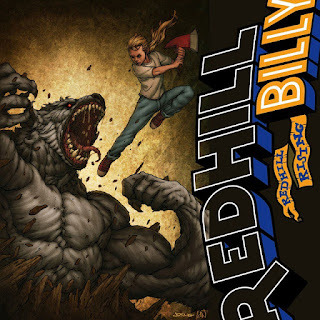 2) What inspired you to create, ‘Red Hill Billy: Red Hill Rising’? I had worked for many years professionally as a sub-contractor for Marvel, DC, Image, and Dark Horse. But eventually I got to an age where I was tired running-around for editors, chasing checks in the mail, and managing editors for my next "gig". So I left comics for a long, long time. 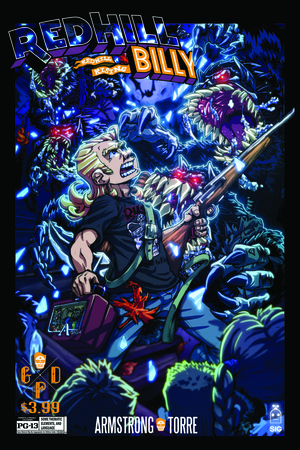 My deep love and reverence for horror movies and comic books prompted me to make a comeback -- in a cinematic-style horror comic! 3) In your own words how would you describe this story? 'Red Hilly Billy: Red Hill Rising' is a throwback to the Amblin-style adventures of my youth. It's like The Goonies or Monster Squad set in Northern Ontario -- 10-year-olds versus giant Rabid Werewolves -- with loads of swearing. 4) What song would you say best represents this comic and why? There's a song by Canadian rapper Buck65 called '463' that rolled endlessly through my diseased brain when I was fleshing out the story. He raps about the killers you could hear whistle late at night in your hometown, the witches cackle you swear you heard right behind you, the monsters that dwell in the bottomless lake, and the struggles of trying to "fit-in" as an awkward kid. 5) If you could get a celebrity – either living or dead – to promote your wares, who would you choose, and why would you want to choose this particular person? 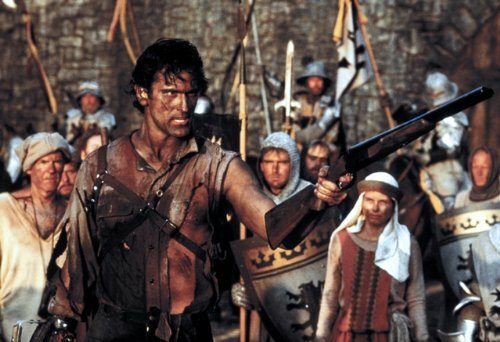 If I could get The Bruce, that's Bruce Campbell of course, to do anything for RHB, I would cry like a smacked baby. Seriously, I met him once and he made me weak in the knees. Like a girl. So for the second part of your question -- Why would I want to choose that person? -- it would be so I could die like a happy, weepy man-child. 6) What have you learnt about yourself through this endeavour? The biggest lesson I've gleaned about myself from this experience is that I am slow to hire and quick to fire. I had to manage every aspect of production, and I suffer no fools. I also learned that if you want to be productive, get away from the TV. Headphones cranked in a room farthest away from anybody else in your place is the best place to be. 7) During your time in this field, what is the one thing that has kept you in good stead? The only thing that has kept me relatively sane in the comic-biz are the other artists and writers. I have met the most gracious, kind, soft-spoken, and giving people in this industry. Yup, its not for the money or the fame. It's so I can continue to hang out with really cool folks. 8) If ‘Red Hill’ had a motto, what would it be? The Red Hill Billy Comic Book Motto is "What doesn't kill you, makes you stronger. Except for rabid werewolves. Rabid werewolves will eat you whole". 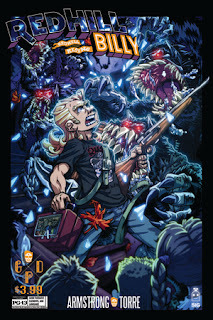 The town of Red Hill has a motto as well: "Don't get eaten". Well, you heard the man, people! Don't get eaten. Get clickin. Especially when you click on Robbie's official Groovy Dead website, facebook, and twitter pages. Stay smart. Stay dead smart.